Most foods have some combination of protein, carbohydrates and fat – even vegetables contain all three macronutrients! So here’s a list of some whole foods and their protein, carbohydrate, and fat content. The reason I am showing you the three macronutrients is because people tend to eat too much of the wrong foods and they are gaining weight or stuck at a plateau and not losing weight. Typically a person is more likely to over eat on starchy carbohydrates or fat. Some foods may contain more fat than protein, adding an excessive amount of calories in such a tiny portion. You want to be aware of these foods so you make sure and eat the right portion so you can easily lose weight. Sunflower seeds raw ¼ cup 6 gr / 6 gr / 14 gr. One food I love is ALMOND BUTTER and I could eat almond butter everyday, twice a day. The problem is it’s loaded with fat which means it’s very calorie dense. Every gram of fat equals 9 calories of energy where as protein and carbs have 4 calories per gram. You have to expend more energy to burn off 1 gram of fat than 1 gram of protein or carbs. Fat is not particularly bad, it’s the quantity that’s the issue. Our body’s NEED fat for many functions so please do not cut them out completely. On average for a female, you want to take in between 7-12 gr. of protein per sitting depending on your calories for the day and if you are eating it for a snack or as part of your main meal. An extra scoop of nut butter here and there can add up to hundreds of excess calories that can sabotage your weight loss progress. It is easy to over eat on nut butters so measure out a serving and put the rest away so double dipping doesn’t happen. What’s the Deal with Complementary Protein? 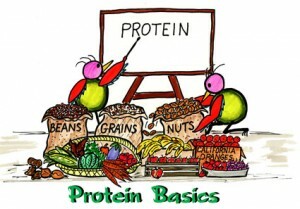 Protein is made up of amino acids, often described as its “building blocks”. We actually have a biological requirement for amino acids, not for protein. Humans cannot make eight of the twenty common amino acids, so these amino acids are considered to be essential. In other words, we MUST get these amino acids from our food. We need all eight of these amino acids for our body to make certain proteins in the body. Only eggs, milk, meat, and fish contain all of the essential amino acids. PLANT PROTEINS on the other hand are usually LOW in one or two of the essential amino acids. For example, grains are lower in lysine (an essential amino acid) and higher in other amino acids. Legumes are lower in methionine (another essential amino acid) and high in other amino acids. As a result, many diet experts insist that vegetarians consume “complementary foods” at a meal – meaning that you eat two foods that combine to give you all the essential amino acids – such as beans and rice. But that’s “OLD SCHOOL” thinking. Recent studies have shown that this is not the case at all. Our bodies have what’s called an amino acid pool where it cycles amino acids in the blood stream and stores them until it can use the amino acids for other purposes in the body or it’s used for energy. Your cells are constantly breaking down and synthesizing new proteins. Each day more amino acids are recycled in your body than are supplied in our diet. If you eat a grain source of protein in one meal and a protein source from beans the next meal, then that will be just as good as eating them together at the same meal. As long as you have a variety of proteins throughout the day, the body will hold on to the amino acids that have not been used and place them in the amino acid pool to be used later. Our bodies are amazing and resourceful. As long as you eat a variety of grains, vegetables, and nuts everyday the body will have the resources it needs to build healthy protein. Protein powders have found their way into every grocery store and health food store. These powders can be helpful in supplementing protein when you are busy or if you are looking for an alternative to beans or nut meal. There are a variety of protein powder options on the market now. Traditionally you would find only egg protein, whey, and soy. With newer technology and knowledge about other healthy sources of protein a new generation of protein powders has arrived. Now you can find pea protein, hemp, rice, and artichoke protein. These next generation protein powders are great for vegans since whey and eggs are dairy-derived the selection was limiting. Remember that protein powder is a supplement and not a meal replacement. These powders supply protein but you will need to eat other foods with your meal to ensure you are power packed with nutrients. Whole natural foods are your PREMIUM source of nutrients and digestible protein so lean on this source mainly and secondly use protein powders. A healthy and safe portion per day is 1-2 servings. A protein smoothie with berries for breakfast and possibly a snack size portion later in the day will boost your protein intake and still give you plenty of opportunities to incorporate whole foods. A serving size of protein powder for a female is approximately 15 grams and approximately 20 grams for men and half this amount for snacks. Thanks for the awesome tips to eat healthier, appreciate it! 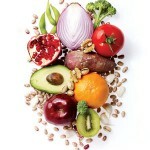 Isn’t it amazing how healthy we can be if we just incorporate these foods in our daily meals? Kardena, I was veg for 14 years before I discovered my body’s issues with soy, so I’ve eaten a lot of beans in my life. How do you get 5 grams of fat in a half cup of black beans?! Every site I search shows about 7g protein and about 1/2g fat. Even the cans of black beans on the shelf in my pantry show 7g protein, 1g fat. Sometimes there are typos and that was one of them! Thanks for catching it and letting me know! I’m not sure if soy protein is safe to eat due to some of its anti-nutrient content…does it have to be eaten in moderation or are there perfectly safe versions of soy? Yes soy has been documented to contain anti-nutrients (enzyme inhibitors), phytic acid, goitrogens, among other elements. Fermented soybeans are shown to greatly reduce the amount of these anti nutrients. If you were to eat soy, I would recommend eating it in fermented form. Tempeh, miso, and nama shoyu (raw, fermented soy sauce). Hi Kardena: I recently discovered your website… and I just love it! I have been a vegetarian for 15 years and recently thinking about going vegan and cutting down my glutten intake. These past two weeks, I have been thinking about protein powders. I am trying out Vega’s smoothie to go (choc flavour). Costco also has Kaizen – but i’m not sure if it’s veg? I’m also worried about gaining weight while taking the protein shake as I’m not much of an exercise person. Thanks in advance for your reply… and keep up the great work. Thanks for your question! I know a lot of people who have trouble with dairy so this might not be a bad idea. The Vega powders are good but can have around 12ish grams of sugar. The Kaizen brand is whey protein which is derived from dairy and also they use sucralose sweetener, which is artificial so I wouldn’t even bother. Protein shakes don’t equal weight gain. Excess calories and junk food calories equal weight gain. just make sure you don’t pack in a ton of ingredients if you are adding ingredients in the blender. Just like any other meal, consume about 300-400 calories. So 25ish grams protein plus 1 cup berries and a fat source. That’s it! A friend of mine gained weight on protein shakes because he put sooo much stuff in it! we calculated the calories and it came out to be around 700 calories! no wonder! I like Plant Fusion or Life’s Basics. You can get unsweetened, they are plant based and no artificial anything. Are protein powders bad for hair roots. I used to take 2 scoops a day and lost a lot of hair. Now I don’t take any protein powders but I miss it as I work out a lot. that’s a very strange phenomenon. I haven’t heard this happening to anyone. If that was the case, they’d probably pull all protein powders off the shelf! That being said, once last year I heard of contamination in one brand of protein powder. I don’t remember which one. I personally recommend it to my clients at the gym and I use it myself. We haven’t had any adverse effects from it. Maybe try a different one?